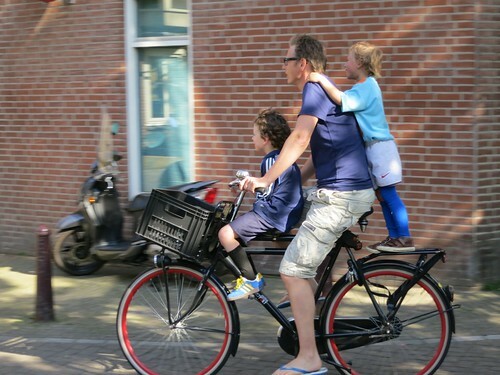 Is the Dutch father in the picture above “insane” for not having his sons wear helmets and not wearing one himself, as Hunter College Professor William Milczarski told the New York Post? Is Amsterdam, “really serious about bicycle safety,” to use NYC Comptroller John Liu’s words, if its citizens can ride on city streets without first strapping plastic and styrofoam hats to their heads? The answer to the first question is no. The answer to the second question is a resounding, emphatic, are-you-kidding-me yes. The only sure outcome of a mandatory bike helmet law is to reverse a promising trend of growing bike use. In Western Australia, one of the few places in the world to have made helmets compulsory, bike use fell of a cliff after the law came in. I’ve also never seen an adequate answer from the pro-helmet lobby for why countries with spectacularly high bike use, like Denmark and the Netherlands, also have extremely low casualty rates – despite the fact that not wearing a helmet is the cultural norm. As Streetsblog and Felix Salmon have noted, Liu’s actual report is “far more positive about bike-share than its author’s press statements would indicate.” But something tells me getting people to read a detailed report wasn’t Liu’s intent. 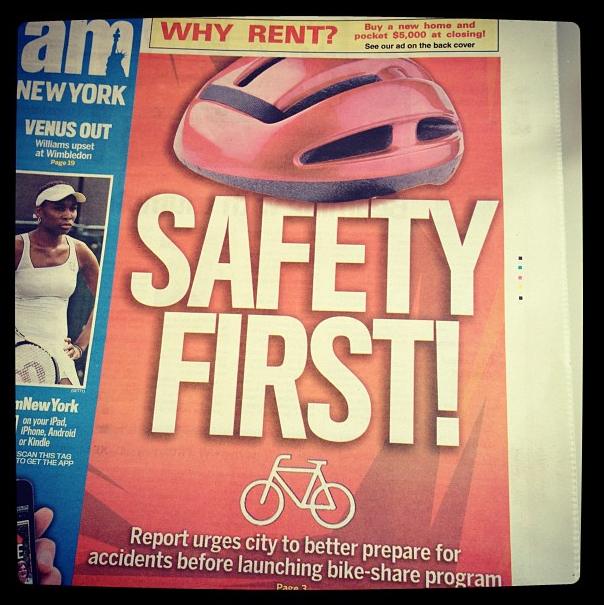 As I’ve argued before, this kind of stuff is a minor hiccup on the way to New York becoming a real cycling city. If the people who purported to care about bicycle safety in New York actually rode a bike in it every now and then, maybe we’d get there a lot faster. I’ve just this week started cycling in New York as I’m in the course of moving from London (as I relate here: http://invisiblevisibleman.blogspot.co.uk/2012/06/feeling-fear-and-doing-it-in-scaredy.html). Very few people wear helmets when using London’s cycle hire bikes – and there have been very few accidents and, as far as I know, no fatalities. Cycling is a lot safer than people think. Another way to think about it is that if you’re going on a two hour recreational bike ride and you think the foam helmet will make you safer, maybe it’s worth the trouble. If you’re making three short cycling trips in a day and doing non-cycling stuff in between, during which you would have to carry around a fairly gigantic and gaudy piece of sports equipment, the convenience cost goes up while the assumed safety benefit goes down—maybe it’s not worth it in that case. The problem for American cycling survival is that, like for other causes, the safety helmet issue became an all or nothing proposition. People are proud of “always” wearing the helmet, and want to make sure that everyone else does too, for good company and so they don’t feel silly. Even for non cyclists the safety helmet became a way to judge cyclists. This toxic culture has kept cycling participation rates down for too long. It’s really up to each adult how they want to ride and what pieces of presumed safety equipment to employ. You might make different decisions on different rides and different days. It doesn’t add up to much danger reduction anyway when dealing with 3-ton vehicles, and it’s certainly not anyone else’s business how you cope with the danger posed by automobiles.